Calphalon Tri-Ply Stainless Steel 13-Piece Cookware Set is a classic set that is beautifully designed to provide the best results you can expect. 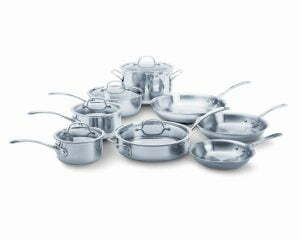 Calphalon products always come with the international standard quality which is very reputable. It’s a three layer cookware that can conduct heat evenly and constantly. The cooking process is made easier with the two layers of stainless steel & a single layer of a heavy gauge. It has a superior interior and exterior stainless steel finish construction that looks very professional. 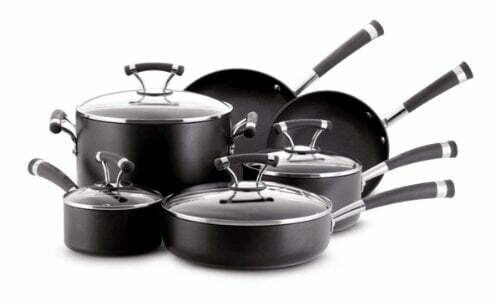 It has a lot of good factors that you never expected to be in a standard cookware set. You’ll be updated with the list of factors while you read the post from top to bottom. But one of the factors is that it has tempered glass lids to hold the moisture & heat. This can lead to cooking the food or dish to the perfection. Glass lids are a surprising addition because most of the other cookwares are made out of stainless steel. You can check the present price of this product from the button at the bottom of this post. Ronald Kasperzak purchased a small company called the “Commercial Aluminum Cookware” in the year of 1963. He has planned to expand the company in the future. As a result, in 1997, he renamed the company to a new name called “Calphalon Corporation”. Calphalon is a revolutionary cookware brand that provides expert culinary kitchen appliances that will change your boring home chef cooking experience to a more pleasant and exciting experience. They have released many ranges of cookwares which are truly incredible. They also provide tips and tricks for cooking recipes in their recipe guide gallery. How Do You Provide a Good Cleaning Care For This Cookware Set? According to the satisfied reviewers of this product they mentioned that this product is very easy to clean without any hesitation. These dishes are so much easier to clean in a couple of ways that do not take so much time. This is another good factor of this cookware series. It can be cleaned either by hand cleaning or using the dishwasher. The instructions to hand cleaning are very simple. First, you have to let the pan get cooled down after you finished the cooking. You have to just leave it standing to cool down for at least 10-20 minutes. Once it’s done soak it in the hot water. This will remove most of the food stains. However, it’s recommended to use the Bar Keeper’s friend to maintain the appearance of the cookware polished & looks like new forever. You can also clean it using the dishwasher. But still the company recommends users to clean it using hand method because it allows you to maintain the quality of the stainless steel. Most of the users said that they found it’s very easy to clean by hand which will remove almost every dirt in the pan. Is This Cookware Set Safe From 450 F Oven Heating & Induction Cooktops? Calphalon Tri-Ply Stainless Steel Cookware set has pots and pans that are safe up to 450 F. Most users said that they tried to heat it at 450 F in the oven & found that it was really safe as the company promised. You can safely move the cookware from the oven using a potholder or by wearing a glove. You can move it from oven to the broiler safely without any messy confusions. The Calphalon brand was officially redesigned to be more efficient & productive in the year 2010. The manufacturer made sure that their cookware is safe on all stove tops and also include induction. This is another important factor of this product. What’s Included With This Product? Aluminium layer coating on the edge parts of the cookware to make sure it conducts heat distribution to the food to cook it evenly. Riveted & steady handles that are firmly attached to the base of the pans & pots to make sure it doesn’t fall off. Tempered glass lids that will block the moisture and heat from vanishing. It’s easy to clean this cookware either by hand cleaning or using the dishwasher. It’s safe on all stove tops including induction. The quality and the durability of this product is good. It’s a very affordable and worthy cookware to buy because it comes as 13 pieces cookware set that can be used for various purposes. It has a superior & user-friendly design construction that looks very durable. A few users said that they found the glass lids to get a bit hot when cooking. Normally it doesn’t get too hot to hurt you. This also depends on mental and physical characteristics of a person. Some people feel a little heat as a high heat because of their mind behaviour. If you feel it’s a bit hot you can use a potholder or a glove to lift the glass lid. This is one of the very minor issues that people face.The manufacturer mentioned not to stack the pots because it might make a scratch on the pot’s surface. You can solve this issue by purchasing some felt dish separators that are available to buy on the internet or in the local shops near you. This is used to separate the pans. Cool-V handle technology to keep the handle cool when lifting it from one place to another. The satin finished interior design construction. Oven safe up to 450D Fahrenheit. It comes with three comfortable sized pans to solve all your frying pan needs. Three layers of aluminium and stainless steel construction for excellent heat distribution. It has all the essential cookware pieces that you need. 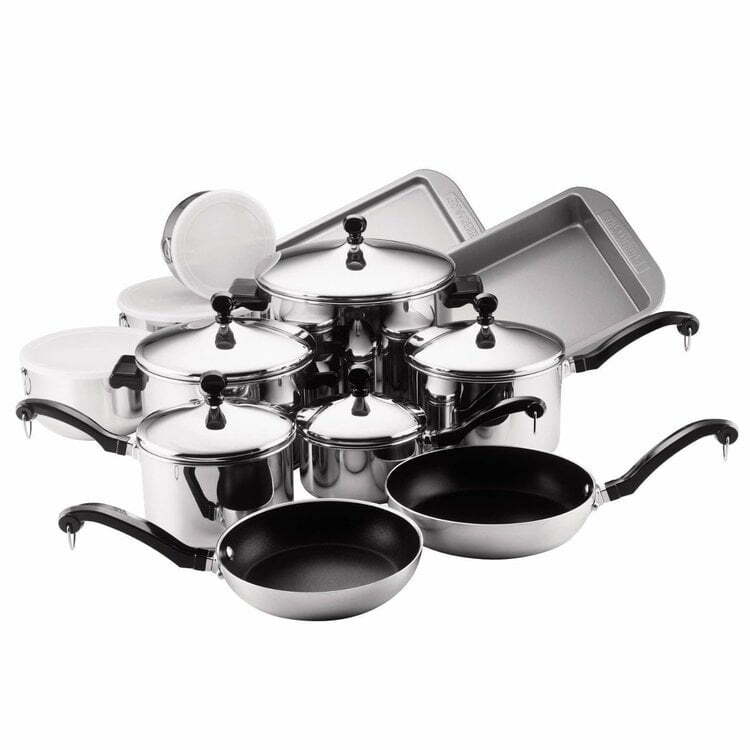 Overall, Calphalon Tri-Ply Stainless Steel 13-Piece Cookware Set is a very affordable, but very professional cookware set that can serve you very well. The Calphalon Corporation has gone through many difficulties in the past to bring out the more improvised & user-friendly brand that serves its customers with what they need at the present situation. It has mainly focused on being extraordinary from the other normal cookware brands available on the market today. This set remains very useful because it has a lot of advantages that are really worth a try. However, it does have some very few minor complaints that doesn’t look that much serious. In our point of view, we think this is one of the best stainless steel cookware that you could find at the present situation. Make sure you read all the points listed here before making your decision. How to Make Food Last Longer?